This morning in Huntington at 7:00AM it’s currently 57 degrees under mostly clear skies. Winds are calm. Relative humidity is 99%, dewpoint 57, barometric pressure 29.94”. Yesterday’s high was 79, and the overnight low was 56. An upper level ridge of high pressure parked over the eastern US will provide dry weather and above normal temperatures through the upcoming week. We’ll see partly sunny skies today with highs in the lower 80s and west winds 10 to 15 mph. Tonight should be mostly clear with lows in the upper 50s and northwest winds around 10 mph until midnight, becoming light and variable. Tuesday should be sunny with highs in the mid 80s and light and variable winds. Tuesday night should be mostly clear with lows in the lower 60s and light and variable winds. Wednesday’s looking sunny and warmer still with highs in the upper 80s and west winds around 10 mph. Wednesday night should be mostly clear with lows in the mid 60s. Last year on this date we had a high of 75 and a low of 65. Burlington norms for this date are 76 and lows of 56. The record high was 92°F in 2010 (we had a high of 89). The Moon is waning gibbous, 16d 20h old with 96% illumination. Watch where you step! If this little toad hadn’t moved as I was walking by I would have completely missed him (or squashed him!) 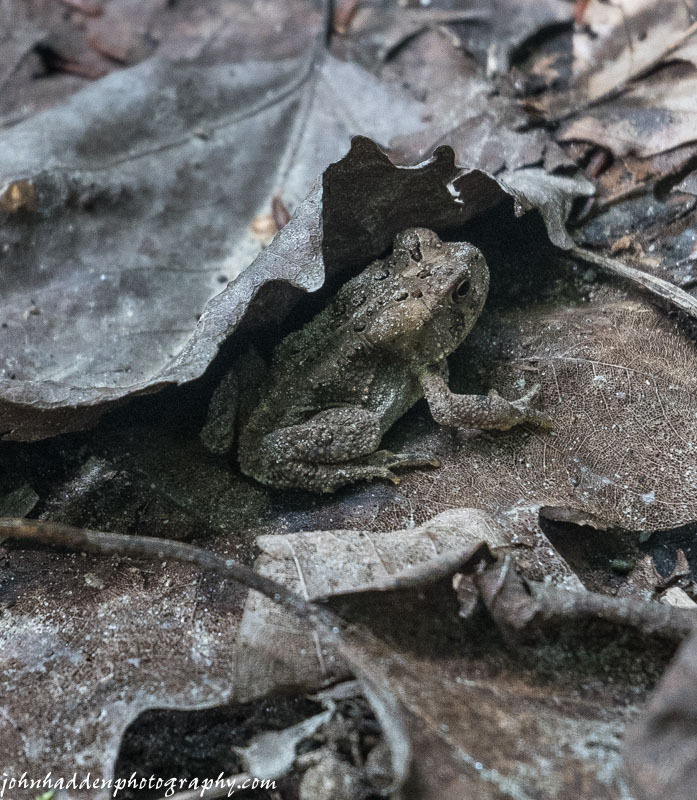 His coloration perfectly matched the leaf litter he was hiding in! Panasonic Lumix GM5, 12-32mm lens @ 28mm, ISO 500, f/5.5, 1/60″ exposure. This morning in Huntington at 7:50AM it’s currently 60 degree under mostly sunny skies. Winds are calm. Relative humidity is 99%, dewpoint 60, barometric pressure 30.06” and rising slowly. Yesterday’s high was 77, and the overnight low was 59. A middle-level shortwave trough will keep clouds and a slight chance for showers over the region today with clouds diminishing this afternoon and evening. Any morning clouds should give way to partly sunny skies this afternoon. Highs will be in the upper 70s with light and variable winds. Tonight should be partly cloudy with lows around 60 and light and variable winds, becoming southwesterly around 10 mph after midnight. Monday should be partly sunny and warmer with highs in the lower 80s and southwest winds around 10 mph, becoming westerly and gusting up to 25 mph in the afternoon. Monday night should be mostly clear with lows in the upper 50s and northwest winds around 10 mph. Tuesday’s looking mostly sunny with highs in the lower 80s and light and variable winds. Tuesday night should be clear with lows in the lower 60s. Last year on this date we had a high of 77 and a low of 51. Burlington norms for this date are 77 and lows of 56. Tomorrow will be 2m55s shorter. The Moon is waning gibbous, 15d 21h old with 99% illumination. I’ve been putting a new camera through its paces the past two days, visiting favorite haunts and subjects. 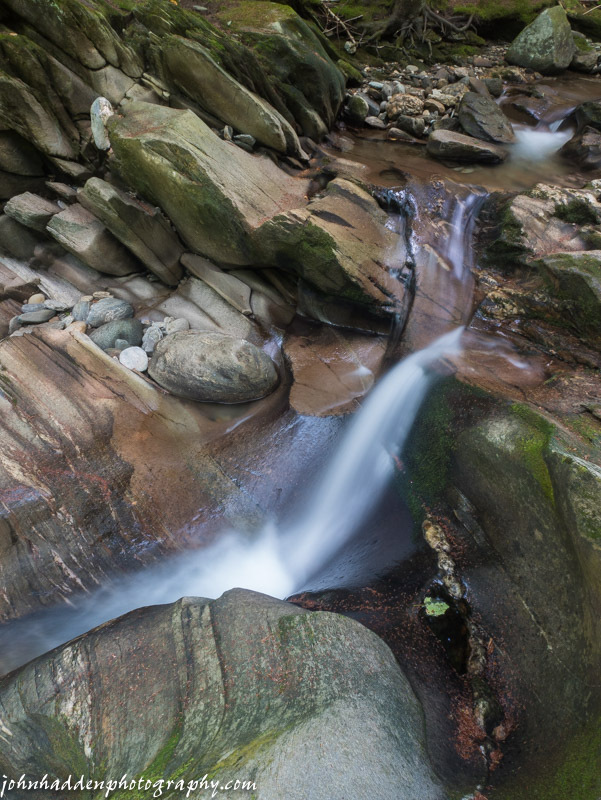 Cobb Brook down in Hanksville offers lovely sculpted rocks that, even in low water, make for some lovely long exposure shooting. You can see a few more of yesterday’s shots on my Photograph Blog. Panasonic Lumix GM5, 12-32mm lens @ 12mm, ISO 200, f/22, 4″ exposure. This morning in Huntington at 7:15AM it’s currently 52 degrees under mostly cloudy skies. Winds are calm. Relative humidity is 99%, dewpoint 52, barometric pressure 30.18” and rising slowly. Yesterday’s high was 75, and the overnight low was 50. High pressure will continue to deliver dry and seasonable weather today. We’ll see partly sunny skies with highs in the upper 70s and light and variable winds. becoming southwesterly around 10 mph this afternoon. Tonight should be mostly cloudy with lows in the upper 50s and southwest winds around 10 mph. A weak disturbance will slide through on Sunday with partly sunny skies and a 20% chance of showers. Highs will be around 80 with light and variable winds, becoming westerly around 10 mph in the afternoon. Sunday night should be mostly clear with lows in the upper 50s and southwest winds around 10 mph. Monday’s looking mostly sunny and warmer with highs in the lower 80s and west winds 10 to 15 mph gusting up to 25 mph. Monday night should be mostly clear with lows in the lower 60s. Last year on this date we had a high of 74 and a low of 52. 14d 20h old with 100% illumination. Other names for this month’s full moon include: “Dog Days” (Colonial American), “Grain” (English), “Dispute” (Celtic), “Wyrt” (Medieval Wiccan), and “Lightning” (Neo-Pagan Wiccan). Another shot from our little sojourn up the Colchester causeway. 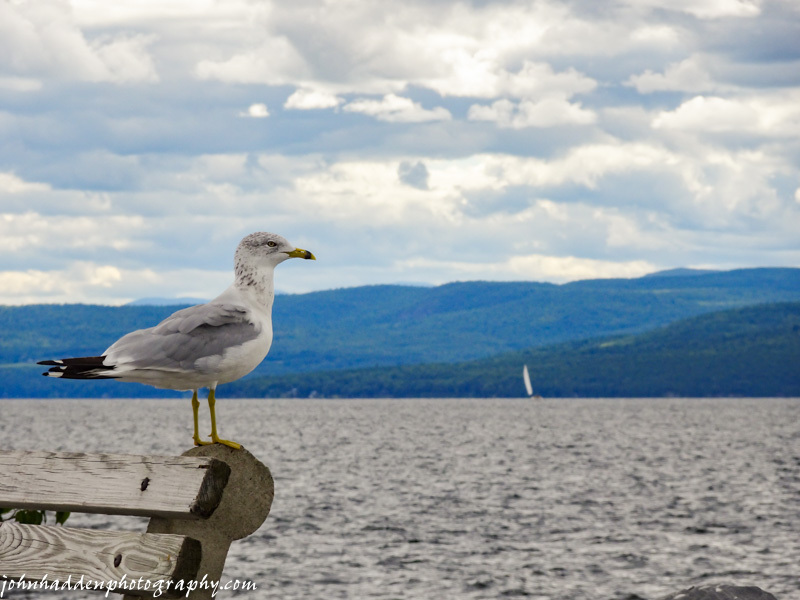 This gull was nice enough to pose for me as it surveyed the scene across Lake Champlain. Sony HX90V, ISO 80, f/6.3, 1/800″ exposure. Camel’s Hump to the App Gap as viewed from the Colchester causeway. This morning in Huntington at 7:409AM it’s currently 56 degrees under clear skies. Winds are calm. Relative humidity is 99%, dewpoint 56, barometric pressure 30.16” and rising. We picked up 0.11” of rain in the past 24hrs. Yesterday’s high was 71, and the overnight low was 52. We’ve got a lovely couple of days on tap courtesy of high pressure which is currently building into the region. We’ll see mostly sunny skies today with highs in the mid 70s and light and variable winds. Tonight should be clear with lows in the lower 50s and light and variable winds. Saturday should be partly sunny and warmer with highs in the upper 70s and light and variable winds. Saturday night should be partly cloudy with lows in the upper 50s and light and variable winds. Sunday should be partly sunny with highs around 80 and west winds around 10 mph. Sunday night should be partly cloudy with lows in the lower 60s. Last year on this date we had a high of 69 and a low of 55. The Moon is waxing gibbous, 13d 20h old with 97% illumination. Robin & I pedaled along the Burlington Bike Path yesterday afternoon out to the Colchester Causeway. The views were spectacular all the way around the compass. 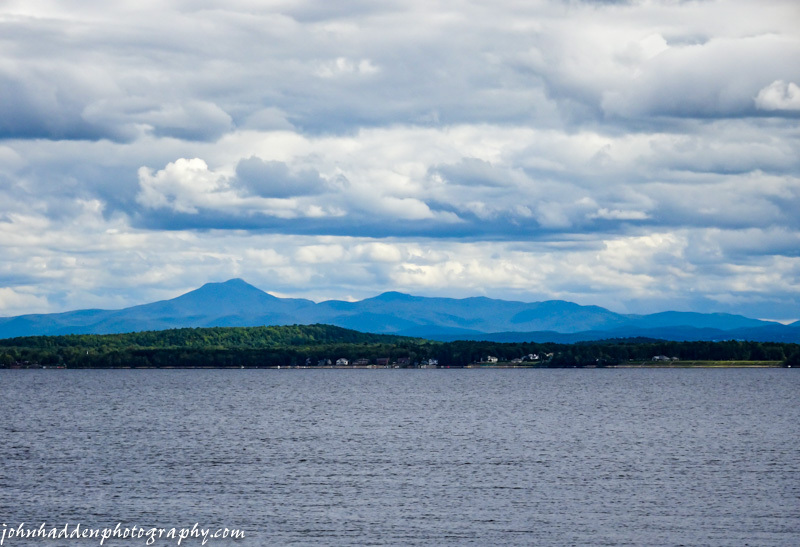 I snapped this nice view across the water of our “home range” of Camel’s Hump from the Winooski River to the Appalachian Gap. Sony HX90V, IOS 80, f/5.6, 1/500″ exposure. This morning in Huntington at 7:25AM it’s currently 57 degrees under overcast skies. Winds are calm. Relative humidity is 99%, dewpoint 57, barometric pressure 29.98” and rising. Yesterday’s high was 74, and the overnight low was 53. A very slow moving upper level trough of low pressure will move across the region today delivering cloudy skies and a 20% chance of scattered showers this morning. The trough should move to our east later in the day allowing for partly sunny skies. Highs will be in the lower 70s with west winds around 10 mph. Tonight should be partly cloudy with lows in the lower 50s and northwest winds around 10 mph until midnight, becoming light and variable. High pressure will build in Friday brining mostly sunny skies with highs in the lower 70s and light and variable winds. Friday night should be mostly clear with lows in the lower 50s and light and variable winds. Saturday’s looking partly sunny with highs in the upper 70s and light and variable winds. Saturday night should be partly cloudy with lows around 60. Last year on this date we had a high of 82 and a low of 59. The Moon is waxing gibbous, 12d 20h old with 92% illumination. 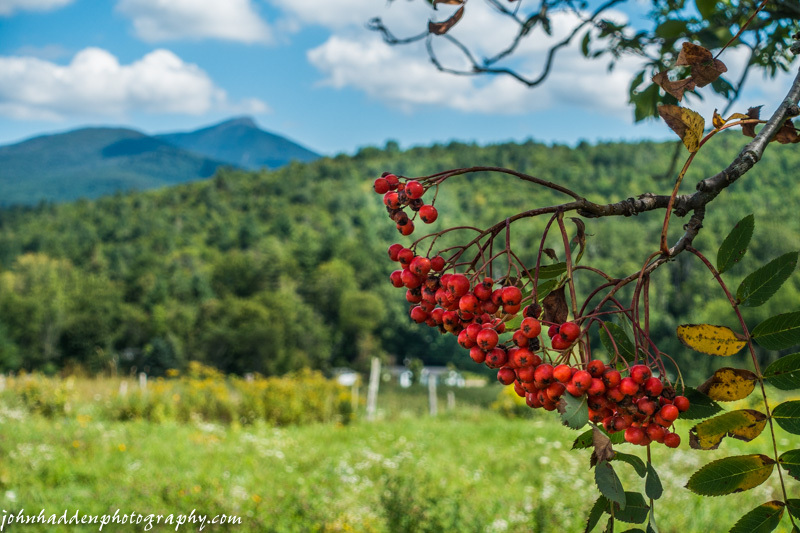 I came across a berry-laden mountain ash tree along Shaker Mountain Road yesterday afternoon. The view of Camel’s Hump in the background made for a nice juxtaposition! Sony RX100m3, ISO 125, f/5.6, 1/320″ exposure. A furtive warbler lurks in the brush around spruce trees. Can anyone identify it? This morning in Huntington at 7:05AM it’s currently 53 degrees under mostly clear skies. Winds are calm. Relative humidity is 98%, dewpoint 52, barometric pressure 29.94” and rising. Yesterday’s high was 80, and the overnight low was 53. Low pressure currently centered over James Bay in Canada will continue to generate the potential for afternoon convection driven showers. We’ll see partly sunny skies with a 20% chance of showers this afternoon. Highs will be in the mid 70s with light and variable winds, becoming northwesterly around 10 mph this afternoon. Tonight should be partly cloudy with a slight chance of showers until midnight. Lows will be in the mid 50s with light and variable winds. Thursday should be mostly cloudy with a chance of showers in the morning, then partly sunny with a slight chance of showers in the afternoon. Highs will be in the lower 70s with light and variable winds, becoming northwesterly around 10 mph in the afternoon. Chance of rain is 30%. Thursday night should be partly cloudy with lows in the lower 50s and northwest winds around 10 mph. Friday’s looking mostly sunny with highs in the mid 70s and light and variable winds. Friday night should be mostly clear with lows in the mid 50s. Last year on this date we had a high of 82 and a low of 56. The Moon is waxing gibbous, 11d 20h old with 85% illumination. 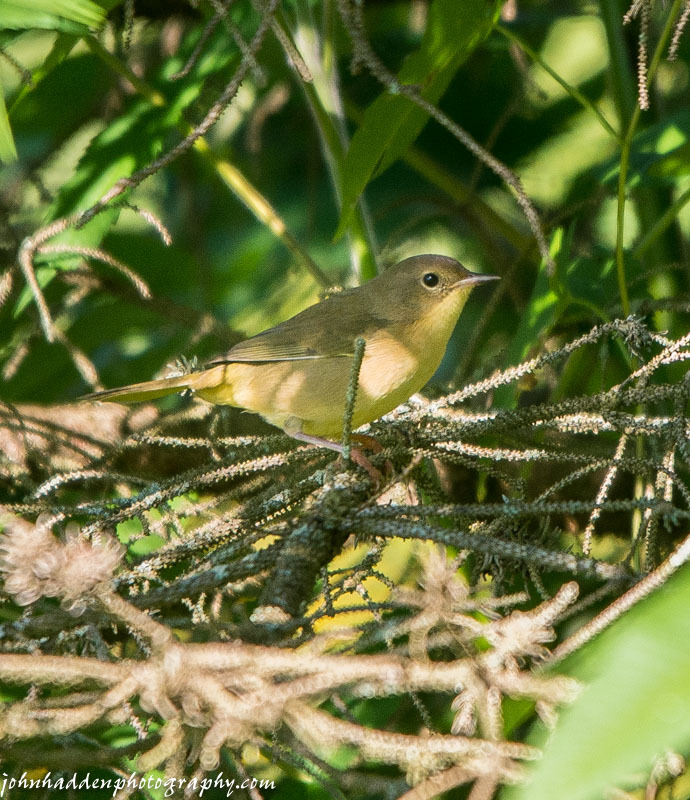 Alright all you bird identifiers out there, what kind of warbler is this? Another Nashville? Orange-crowned? He was lurking in the brush beneath the spruce trees in our front yard. Nikon D600, Sigma 120-400mm lens @ 400mm, ISO 640, f/7.1, 1/400″ exposure. This morning in Huntington at 6:50AM it’s currently 59 degrees under mostly clear skies. Winds are calm. Relative humidity is 94%, dewpoint 57, barometric pressure 29.82”. Yesterday’s high was 82, and the overnight low was 59. A large-scale upper level low just north of the Great Lakes this morning will remain the primary weather maker for our region through Thursday as it moves slowly eastward and gradually weakens over time. An associated cold front is crossing our region this morning, kicking off showers to our south. The forecast calls for cloudy skies (though I don’t see ’em…) with a chance of showers and a slight chance of thunderstorms this morning, then partly sunny skies with a slight chance of showers and thunderstorms this afternoon. Highs will be in the upper 70s with light and variable winds. Chance of rain is 30%. Tonight should be partly cloudy with lows in the upper 50s and light and variable winds. Wednesday should be partly sunny with a 30% chance of showers in the afternoon. Highs will be in the mid 70s with light and variable winds. Wednesday night should be partly cloudy with a 30% chance of showers. Lows will be in the mid 50s with light and variable winds. Thursday’s looking partly sunny with a 40% chance of showers. Highs will be in the lower 70s with west winds around 10 mph. Thursday night should be partly cloudy with lows in the lower 50s. Last year on this date we had a high of 84 and a low of 53. The Moon is waxing gibbous, 10d 20h old with 76% illumination. 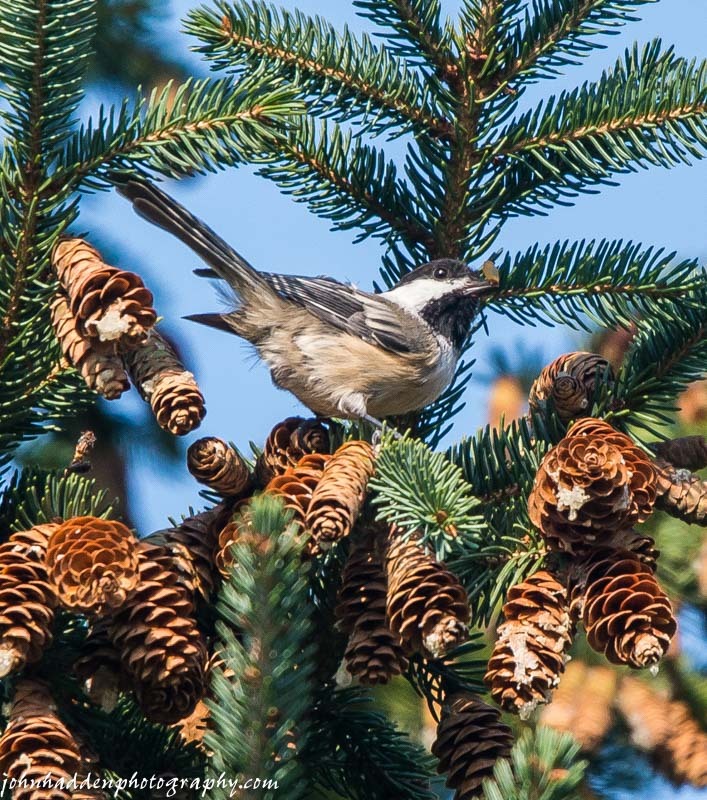 Periodically through the day, a chatter of chickadees will move into the spruce trees in our front yard to feed on the cones. They’re often joined by titmice and warblers. Nikon D600, Sigma 120-400mm lens @ 400mm, ISO 640, f/7.1, 1/800″ exposure.